An article by Carol Clark, Emory University on phys.org - Changes in rat size reveal habitat of 'Hobbit' hominin - reports on new research on the habitat of the hominin Homo floresiensis. At the Liang Bua cave site, paleoanthropologist Matthew Tocheri, left, measures a modern giant rat with the assistance of Bonefasius Sagut. 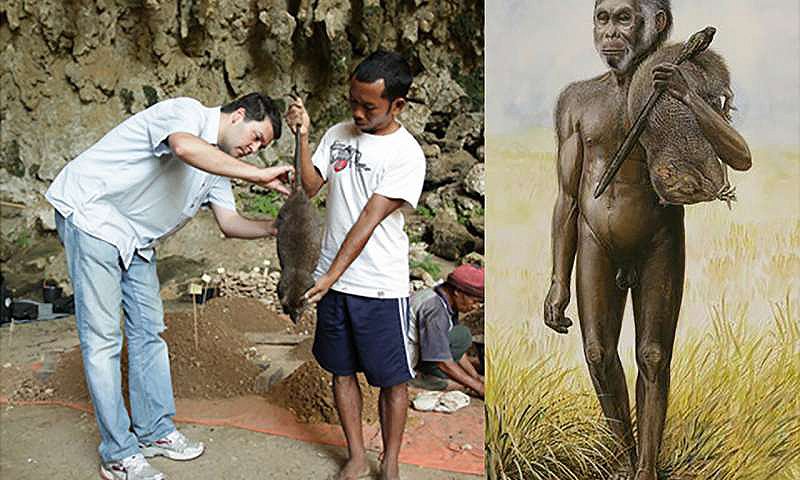 At right is a reconstruction of Homo floresiensis carrying a giant rat, by paleo artist Peter Schouten. Credit: Reconstruction of Homo floresiensis by Peter Schouten. A study of rat body sizes shifting over time gives a glimpse into the habitat of the mysterious hominin Homo floresiensis nicknamed the "Hobbit" due to its diminutive stature. Elizabeth Grace Veatch, a Ph.D. candidate at Emory University and a first author of the study, explains that the paper is the first "that we know of" to use the leg bones of rats in this way to interpret ecological change through time, and it provides new evidence for the local environment during the time of Homo Floresiensis. Veatch looks at piles of sediment excavated from Luang Bua as it is being wet sieved using the irrigation system of a rice paddy near the cave site. Photo by Hanneke Meijer. Credit: Hanneke Meijer. Veatch is focusing on the rats: murids, as the rat family is known, are more taxonomically diverse than any other mammal group and are found in nearly every part of the world. She explains that they exhibit an incredible range of behaviours occupying many different ecological niches, and because small mammals are typically sensitive to ecological shifts, they can tell you a lot about what's going on in an environment. The study was based on remains recovered from the limestone cave known as Liang Bua, where partial skeletons of H. floresiensis have been found, along with stone tools and the remains of animals - most of them rats. The study encompassed about 10,000 of the Liang Bua rat bones. The remains spanned five species with distinct sizes, from the mouse-sized Rattus hainaldi up to the housecat-sized Papagomys armandvillei - commonly known as the Flores giant rat. After categorizing the bones, the researchers could then directly link them to both species and environmental types. For Veatch, the evidence suggests that Homo floresiensis may have preferred more open habitats where they may have been a part of this scavenging guild of Stegodons, storks and vultures. She thinks that when the habitat changed, becoming more forested, Homo floresiensis probably left the Liang Bua area, tracking these animals to more open habitats elsewhere on the island. One key question is whether H. floresiensis hunted small game. Liang Bua offers an ideal opportunity to study what a small-brained hominin, like H. floresiensis, might hunt if it had both sources of big game, like the Stegodon, and small game, like the giant Flores rat and other rat species. 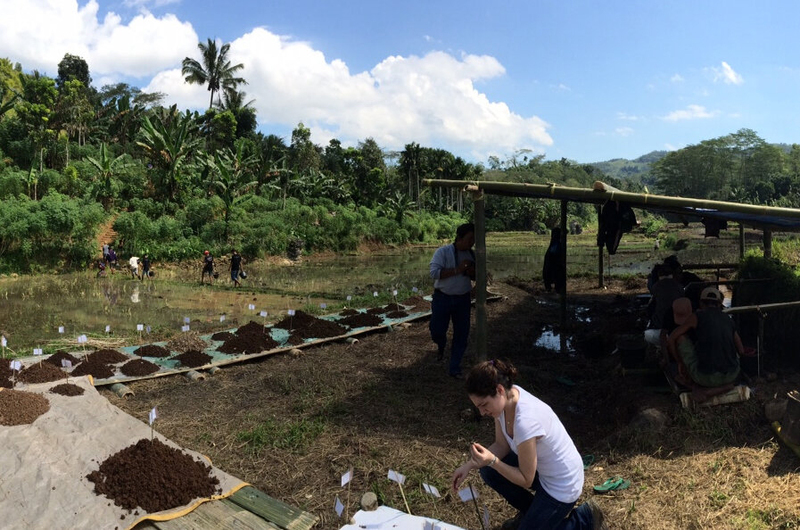 Veatch is conducting field studies at the Liang Bua site, including running experiments to determine how difficult it would be to capture wild Flores rats. She is also doing research at the Pusat Penelitian Arkeologi Nasional (ARKENAS) Museum in the Indonesian capital of Jakarta where many of the bones from the cave site are now stored. She is analyzing a large sample of the bones to determine if any have cut marks?indicating butchering with tools?or pitted marks that would indicate they were digested by owls or other raptors that may have deposited them in the cave.